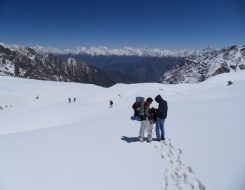 As compared to the trekking expedition to Deo Tibba, the Friendship Peak expedition would seem a cake walk. Though equal in term of number of days, the trip takes the trekker to a different dimension all together, where physical determination and stamina is tested. The journey starts from Manali, where trekker gets to stay for the first day and enjoy the place just as the other tourists do. The next day is full of drive, through Parini, Pondurupa and Setan, passing through the changing landscapes on the serpentine and voluptuously curvaceous mountain roads. 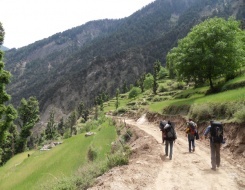 The first part of the trip consists of crossing Hampta Pass before reaching Chhika. 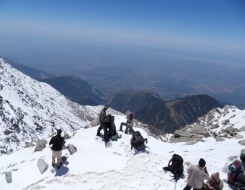 The first view of the Mt Deo Tibba is revealed on the way from Chhika to Marhi, along with the other peaks in the group. From here onwards, the majesty of Himalayas starts imposing in full effect as are the other aspects of the topography- moraines, glaciers and snow all around. 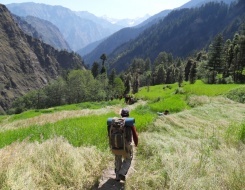 The trip adds newer names like Piyangniru, Jogidugh, Tilgan, etc with the trek getting strenuous all the while. Here onwards the descent is started to Manali. Being in Himalaya and not be in touch with divine is just not possible, be it with the way of Nature or religious and regional mythologies. Various stories and folk tales at different places related to special Gods and Goddesses keep the trekkers interested in the area all the more. Historic caves and vantage points to better view the glory of Nature becomes bonus of adventure holidays spent doing Mt Deo Tibba trekking. After breakfast half day sight seeing at Delhi and by evening drive to Manali by AC Volvo coach. Overnight journey. After breakfast drive to Prini village, Path leads through the Mount Deo Tibba Expedition village By Zig-zag trail to the valley floor and offers an extensive view. Reach Khangpa village of Saten who are migrated from Spiti. (From Tibet in the olden time). Khangpa community use to move as Nomade of Chang-thang does till now. Dinner and overnight stay in camp. Trek gets little steeper in the beginning and after that all the way descend down to Raurikhaudi. Local Shepard’s of Kullu Mount Deo Tibba Expedition Valley can be seen grazing their herds of sheep goat. Dinner and overnight stay in camp. Day 9 Raurikhaudi - Jogidugh (3000 mts/10824 ft) Lamadugh/sorotu) 4 hrs.